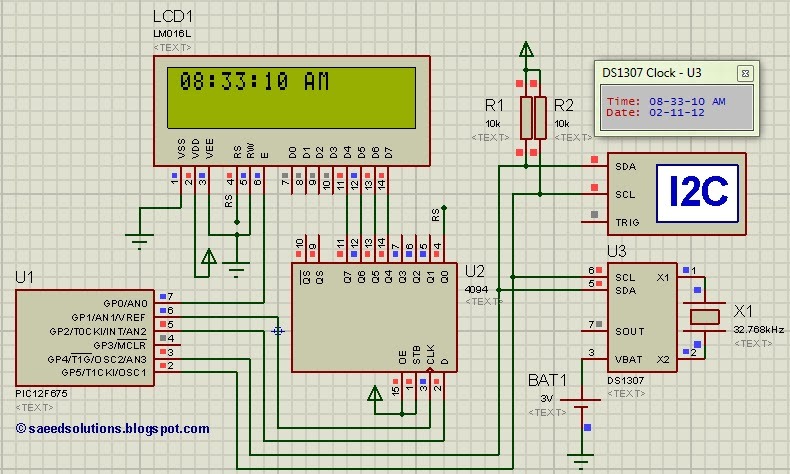 This post provides the code for interfacing DS1307 RTC with PIC12F675 microcontroller. This DS1307 RTC has i2c based interface and PIC12F675 doesn’t have any built in i2c modules, so software i2c module is created in the code. This code is written in C language using MPLAB with HI-TECH C compiler. You can download this code from the ‘Downloads‘ section at the bottom of this page. 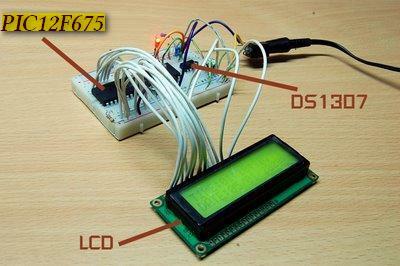 It is assumed that you know how to interface LCD with PIC12F675 microcontroller. If you don’t then please read this page first, before proceeding with this article. 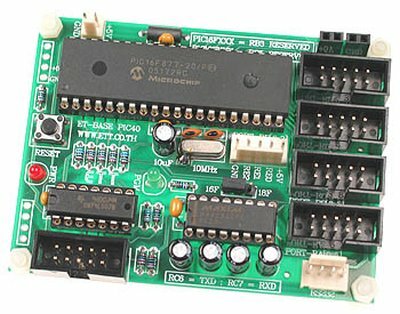 It is also assumed that you know how to create software i2c module in PIC12F675 , if you don’t then please read this page first. The result of simulating the code in Proteus is shown below. In the above circuit, GP4 pin is being used as SDA pin and GP5 pin is the SCK pin. Both of these pins are pulled up using 10K resistors as required for i2c protocol. DS1307 RTC is the slave device, while PIC12F675 is configured to be the master. LCD is also attached with PIC12F675, just to show the values received from the RTC, otherwise it is not required in this circuit. Proteus provides an ‘I2C Debugger Tool‘ which is attached on the SDA and SCK pins in the above circuit, this debugger shows all the activity on i2c bus. It is attached in the circuit just for debugging purposes. In the code, in the start a command is sent to DS1307 to set time to 8:32:59 AM and date to 2/11/12. After this, DS1307 starts to increment it’s time after every second. Then new time is read from DS1307 RTC after every second and displayed on the LCD. Figure 1 was taken when time was 8:33:10 AM, which is correctly displayed on the LCD. The code for the main function is shown below. DS1307 RTC interfacing with PIC12F675 code was compiled in MPLAB v8.85 with HI-TECH C v9.83 compiler and simulation was made in Proteus v7.10. To download code and Proteus simulation click here.